My name is Melissa Newberry and I've always loved creating. Ever since I can remember I would always be creating something whether it was with clay or painting, I loved making art and still do. As I have gotten older that passion has only grown stronger and I want to spread that joy of creating to others. Not only am I an artist here at Pinto's Palette, but I am also graduating this May from Colorado State University with a degree in Art Education. I love working with people and teaching them new skills that they can take with them where ever they go. Some of the work I enjoy making is what I find most challenging to do. I work in metals and oil painting, both of which take a lot of time and effort, but it is the challenge that makes the final product so rewarding. Some might even agree that the challenge of painting here at Pinto's is rewarding when you end up with a master piece at the end! Melissa will be featured during our First Friday Art Walk on Friday April 5th from 6-9 PM! 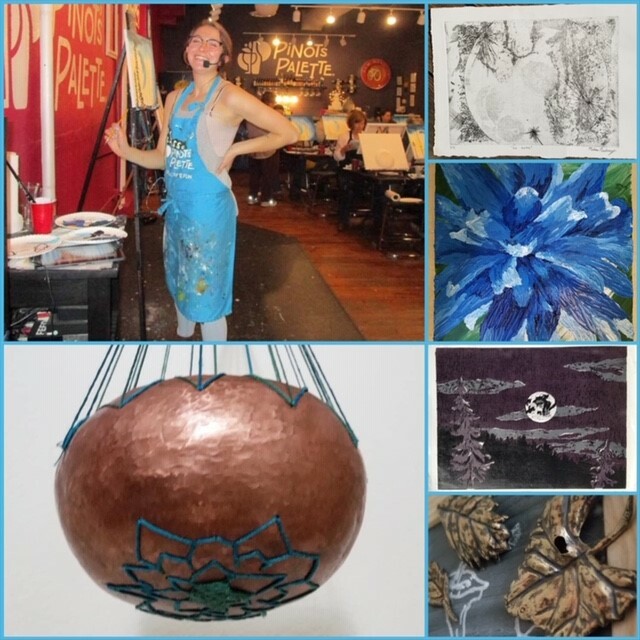 Come stop in, see a live show, say hi to Melissa, and support local art!